What other words or phrases do we use instead of saying the word ‘death or that someone has died? Please let me know if you are able to contribute more expressions of ‘death to this list. My grandson’s naming ceremony and teddy bears’ picnic took place in the family’s cottage garden beneath a willow tree. The joy of preparing for this special celebration with my daughter and her husband made me realise that many other young parents may like to explore such possibilities. This is a chapter from my yet unpublished book of Naming and Welcoming Ceremonies. Plastic bags weren’t good for the environment. I would have signed up for the One Spirit training years ago had it not been for my rapidly deteriorating eye sight. I was eventually told by my ophthalmologist that nothing could be done to improve the situation. I had already given up driving and could no longer see to cross the road safely, let alone thread a needle. It was at this point I decided to apply for a guide dog but thanks to modern technology a miracle took place. 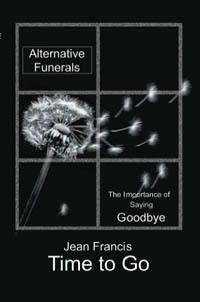 When my ex-husband was told he had only a short while to live he asked if I would write and conduct his funeral. I began to put words together and as I read them to him over the phone asked him to stop me if he wanted to make changes. During this process he opened up in a way I had never known, in all our years of marriage and it was like our hearts really touched for the very first time. Has Your Child Been Formally Welcomed Into This World? Those that follow a traditional faith-path will no doubt go to their own place of worship to have their off-spring blessed, named and welcomed into the world. There are many people who have a deep spirituality but feel they don’t fit into any particular box; rather like me before I trained to become a OneSpirit Interfaith minister/celebrant. My training enables me to respect people of all faiths or none, holding the view that there are many paths to one truth. Together, with the family I create and carry out creative and loving ceremonies that celebrate the many milestones of life. A ceremony creates a heart and a focus to any gathering especially when witnessed by family and friends, becoming an important milestone in the lives of all those present. 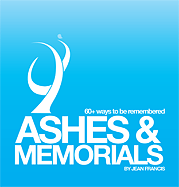 • Remember those unable to be present for whatever reason by lighting a candle in their honour. We are all unique beings, let us together, create a ceremony that honours your uniqueness as a family – Contact me – I’m always up for a challenge!! Skip your eye drops this morning and read this instead. This is the kind of story you need when it seems like the world is spiraling out of control. Not many people can get a picture of this proud bird snuggled up to them! Freedom and Jeff Freedom and I have been together 11 years this summer. She came in as a baby in 1998 with two broken wings. Her left wing doesn’t open all the way even after surgery, it was broken in 4 places. She’s my baby. When Freedom came in, she could not stand and both wings were broken. She was emaciated and covered in lice. We made the decision to give her a chance at life, so I took her to the vet’s office. From then on, I was always around her. We had her in a huge dog carrier with the top off, and it was loaded up with shredded newspaper for her to lay in. I used to sit and talk to her, urging her to live, to fight; and she would lay there looking at me with those big brown eyes. We also had to tube feed her for weeks. This went on for 4-6 weeks, and by then she still couldn’t stand. It got to the point where the decision was made to euthanize her if she couldn’t stand in a week. You know you don’t want to cross that line between torture and rehab, and it looked like death was winning. She was going to be put down that Friday, and I was supposed to come in on that Thursday afternoon. I didn’t want to go to the center that Thursday, because I couldn’t bear the thought of her being euthanized; but I went anyway, and when I walked in everyone was grinning from ear to ear. I went immediately back to her cage; and there she was, standing on her own, a big beautiful eagle. She was ready to live. I was just about in tears by then. That was a very good day. We knew she could never fly, so the director asked me to glove train her. I got her used to the glove, and then to jesses, and we started doing education programs for schools in western Washington. We wound up in the newspapers, radio (believe it or not) and some TV. Miracle Pets even did a show about us. In the spring of 2000, I was diagnosed with non-Hodgkin’s lymphoma. I had stage 3, which is not good (one major organ plus everywhere), so I wound up doing 8 months of chemo. Lost the hair – the whole bit. I missed a lot of work. When I felt good enough, I would go to Sarvey and take Freedom out for walks. Freedom would also come to me in my dreams and help me fight the cancer. This happened time and time again. Fast forward to November 2000. The day after Thanksgiving, I went in for my last checkup. I was told that if the cancer was not all gone after 8 rounds of chemo, then my last option was a stem cell transplant. Anyway, they did the tests; and I had to come back Monday for the results. I went in Monday, and I was told that all the cancer was gone. So the first thing I did was get up to Sarvey and take the big girl out for a walk. It was misty and cold. I went to her flight and jessed her up, and we went out front to the top of the hill. I hadn’t said a word to Freedom, but somehow she knew. She looked at me and wrapped both her wings around me to where I could feel them pressing in on my back (I was engulfed in eagle wings), and she touched my nose with her beak and stared into my eyes, and we just stood there like that for I don’t know how long. That was a magic moment. We have been soul mates ever since she came in. This is a very special bird. On a side note: I have had people who were sick come up to us when we are out, and Freedom has some kind of hold on them. I once had a guy who was terminal come up to us and I let him hold her. His knees just about buckled and he swore he could feel her power course through his body. I have so many stories like that. 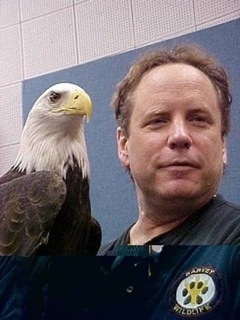 I never forget the honor I have of being so close to such a magnificent spirit as Freedom!! Hope you enjoyed this! Workshops around planning your end of life celebration. Knowing that your last wishes are in place frees you to up to enjoy life to the full. Taking this thoughtful action will also ease the way for those left behind. 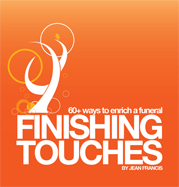 In a workshop Jean would guide you through the many options available and answers any questions that may arise while planning your final farewell. Finalise the contents of the ceremony/service; do you wish to have a gathering afterwards? How would you like to be remembered? Tuesday April 25th – Pretty things tea rooms, Park Place, Horsham, RH12 1DG – 10.am – 4.pm. Delicious refreshments available to purchase all day. Friday May 12th – Congleton, Cheshire. Or at a venue and date of your choice. the aisle. They reached the altar and the waiting groom. The guests in the front pews responded with ripples of laughter. marriage, the bride gave him back his credit card.